A friend of mine asked me recently about my years as a birth doula, and it brought all kinds of helpful memories back, as we wait on Mary Elizabeth to deliver her lamb. My doula business was called Abiding Birth Companions, because "abiding" is much more than just waiting. One of my most important responsibilities as I assisted birthing couples, was to watch and wait patiently, accompanying them on the journey, encouraging them to trust the process. I encouraged couples not to rush the birth, but to relax and let the pregnancy unfold naturally and safely. I guess it's my turn to need a sheep-birth doula. I need to be reminded not to rush the process, or wish away the waiting, or to put life on hold in the interim. This is very hard for me. I love control too much - especially since, in this case, control is absolutely impossible. The pregnancy was a complete surprise and we don't even have a ballpark idea how long we might have to wait. Yesterday, Mary Elizabeth went on her own into the little lambing jug I had just freshened up, so I pulled up a stool and just sat with her. 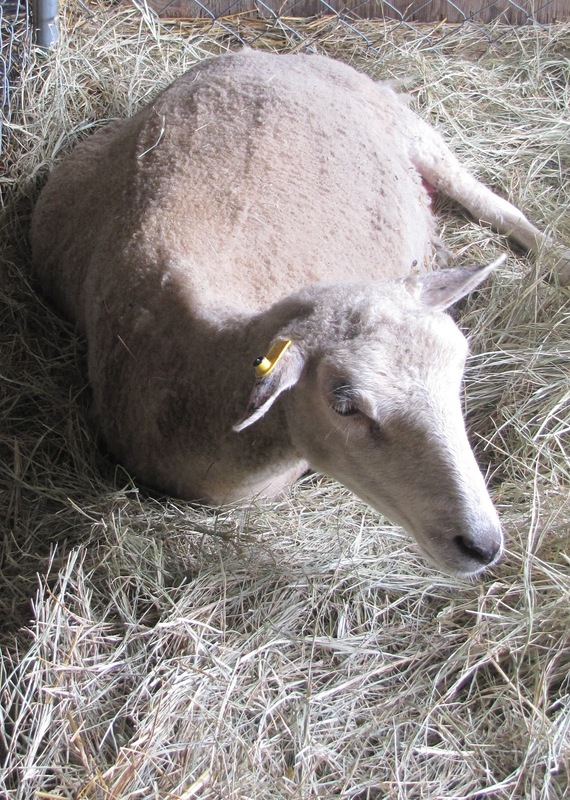 She nibbled at hay, laid down, dozed, and breathed steadily, chewing her cud. As she was lying on her side, I got my first really good look at some lamby-gymnastics going on inside her, and I had to just smile ear-to-ear. The baby, or babies, will come. It's inevitable. I found myself doing what I did with my human doula clients - when we thought we couldn't bear the wait any longer, I began visualizing the baby in the space where he or she would live, soon. I saw Mary Elizabeth nursing her lamb in that jug, and that lamb running and jumping for joy in the pasture with all the other sheep. It's coming. I just need to sit down, and wait. ...and we'll try to follow your good example. It's just that waiting is so hard! What a lovely post, and for me, a good reminder to slow down and live in the moment; not to wish the day away for some event in the future. It's been a long time since I've done that, and you made me realize that there is joy in the waiting, too. Thank you, and good luck with your waiting.